Ainakoa Wood Co. represents the works of award winning Master Wood Craftsman Michael Felig, who has earned the reputation as one of Hawaii’s premier furniture makers. From the remote northern tip of the Big Island, Michael custom crafts heirloom quality Koa furniture for some of the nation’s most discerning clientele. From Tokyo to England, and everywhere in between, collectors unanimously select his handcrafted works made from the island’s most exotic woods. Michael’s passion is the wood, and it shows with every finished creation. Each piece of Koa is hand selected for its distinctive grain and color, dried in a specially built kiln, and carefully cured before it is ultimately chosen for a specific piece. Whether it’s an elegant side table or a traditional Queen Liliuokalani rocking chair, attention to detail and an eye for design is what sets his work apart from others. Each completed piece offers a fine finish that is unsurpassed in both quality and durability. If you are interested in an Ainakoa piece, please browse our photo gallery, where you can see examples of previous work. Select from a wide range fo entry, coffee, side and dining tables, chairs, four poster beds, desks, settees, armoires, heirloom rockers, and anything else your imagination can conjure. Ainakoa furniture is showcased in various galleries on the Big Island, located on the “Where to Find Us” page. If you would like to design a custom piece, feel free to browse our styles and wood inventory, and contact us with your inquiries. 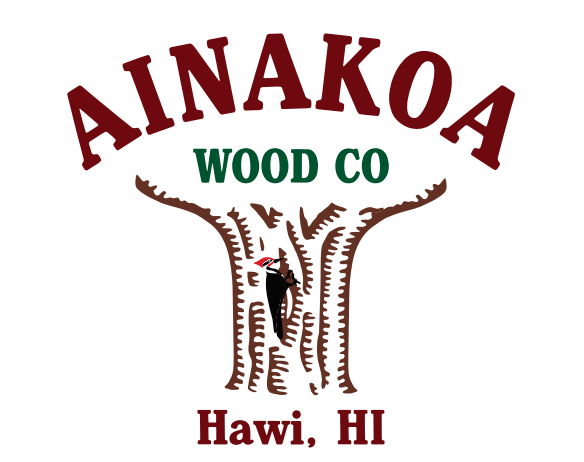 Ainakoa Wood Company will craft, crate, and ship your island treasure with care and Aloha!